Ken Schram Photography: Put a Pin in It? Put a Pin in It? Facebook this. Google+ that. Retweet it. Upload it to Flickr. Blog it. Don’t forget 500px. As if any of us need another social media outlet. So why in the world am I blogging about Pinterest? 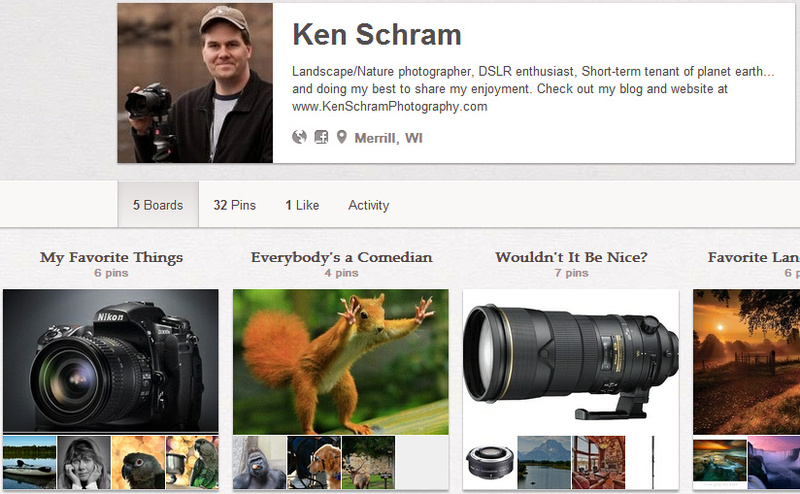 A while back I caught an episode of “The Grid” with Scott Kelby and clan and Pinterest happened to be the topic de jour. After digesting their opinions on this popular site, I thought “Eh. Why not?”. As was their viewpoint, Pinterest is MY bulletin board. It’s the place where I tack up those things that help me through the day – things I’d like to do, have, see…. It’s an exercise I already practiced, but now it’s been “webified”. I don’t feel any pressure to post daily or comment on someone else’s activity. It’s just my own personal bulletin board for me which just happens to be visible to the world . If you have an interest in learning more about what makes me tick, feel free to have a look: http://pinterest.com/kenschram. One word of warning/advice/caution… As you’re probably already aware, one of the things that helps guide my life is photography. Viewing other people’s work is a BIG part of that. Respecting their images as their own intellectual property is also something I take very seriously. Being able to share photography that I find inspiring while still respecting the owners rights is a fine line to walk. My personal practice is to ALWAYS cite the original source and give credit to the owner. If for some reason the owner takes issue with my sharing their acknowledged work, I would immediately and without resentment abide by their wishes. If you’re “pinning”, I would hope you’d consider the same practice. Enjoy!